In the Philippines, sweet spaghetti also known as Filipino Style Spaghetti is the favorite pasta dish among kids. Here in the US, it’s Macaroni and Cheese. It is an old American favorite which is now included in almost all restaurants’ kids menu. Its popularity really took off after Kraft introduced a boxed version in the 1930s. This became so popular that many prefer the packaged version more than homemade. Well, I still think homemade is best. There are primarily two ways to make mac and cheese. The traditional Southern method includes mixing milk or cream and grated cheese right into the hot pasta then eaten as is or baked in a casserole dish. The other popular method is to make a roux (flour and butter), then add milk or cream or even stock to make a thick sauce. Then grated cheese is stirred into the sauce until it melts and the mixture is combined with cooked pasta. My daughters prefer the unbaked Southern version with a hint of sweetness from the addition of condensed milk. It has become their favorite pasta dish next to Filipino-style spaghetti. They love it so much that I have to cook it every week! This recipe is so simple and very easy to prepare. Try it…and see for yourself that there's a better version than the boxed one! * I shared this on Mac and Cheese Quest, What's Cooking Wednesday, Foodie Wednesday, What's on the Menu Wednesday, Real Food Wednesday, Miz Helen's Country Cottage's Full Plate Thursday and It's a Keeper Thursday. Btw, the Online Bake Sale for Japan will go live today at The Tomato Tart. 90 foodies from 8 countries donated their homemade goodies for this event. Please be generous! Bid on any of the delectable goodies and help us raise money for Japan. 1. Cook macaroni as directed on package. I do mine in 5 cups boiling water with 1 Tbsp salt for 8-10 minutes. Drain well. Return to pan. 2. Add remaining ingredients. Mix well. While stirring constantly, cook over low heat until Velveeta cheese is melted. 3. Remove from heat. Transfer to a serving plate. Garnish with Italian parsley and serve. Lovely Tina but have to omit the beef and condense milk to suit our taste at home. what a nice recipe!! YUM! This looks really creamy and delicious. Cannot wait to try it. I agree, homemade is best! Congrats on top 100 in Babble! I voted for you. @Lin Ann: Thanks for the vote, my dear! Oh Tina that looks scrumptious!! I want some mac 'n cheese now! I haven't had any in a looong time... thank you for reminding me of this yummylicious meal. Mmmm, this looks so cheesy, ooey, and gooey, and YUMMY! 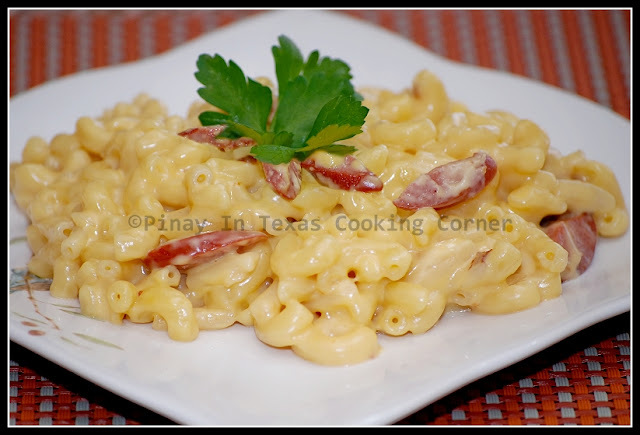 There is nothing better than a great Homemade Macaroni and Cheese and your recipe looks delicious. Thank you so much for sharing with Full Plate Thursday and hope to see you next week! The perfect comforting dish! Love it! I wanted to invite you to join in on a WEEKLY RECIPE LINK PARTY on my blog. "Made it on Monday" is ready for link up's every Wed.-Sat. we love homemade mac & cheese here. I do it southern style and bake it...yummy! I'm looking forward to seeing more of your recipes! This is such a comforting dish! Looks divine! Wouldn't you know I just started a Mac and Cheese Quest i.e. 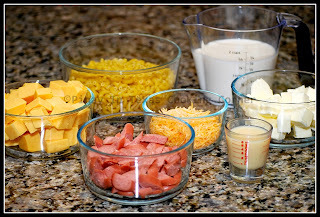 The best mac and cheese recipe! I would love for you to link this up - everytime I write a new mac and cheese post, it will show up with the linky. Mmm I LOVE mac and cheese! One of my all-time favorite dishes. Thanks for sharing! Hi Cindy! You can substitute Velveeta cheese with either American or mild cheddar cheese. Both take a little longer to melt than Velveeta cheese, but they will work fine.